I don't know about you, but I'm ready for some sunshine. 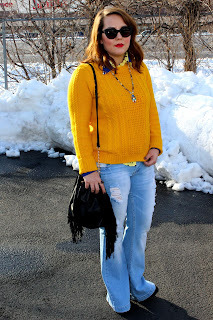 When it gets to be this time of year and there's still a lot more winter ahead, I have to help my mood out a little bit by injecting some bright colors into my wardrobe. 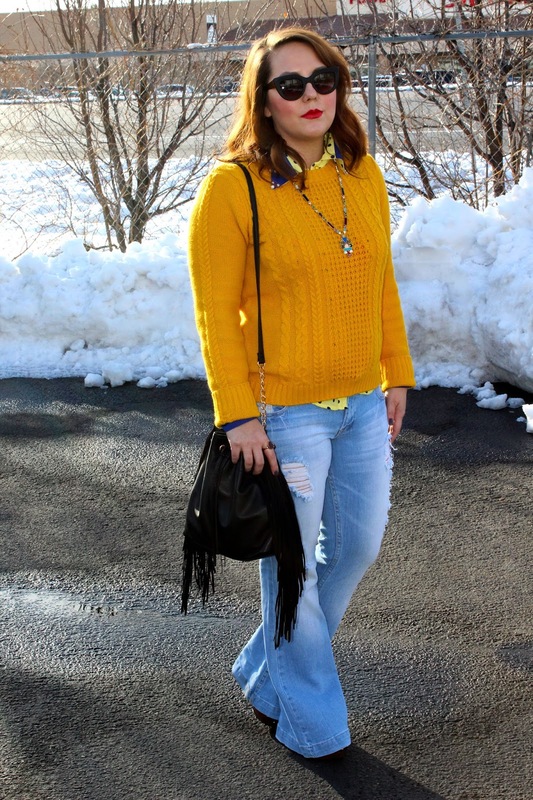 I'm loving bright yellows right now and this sweater brightens my day as soon as I put it on. This color always reminds me of the 70's...I'm pretty sure most of my mom's clothing was this mustard yellow hue. 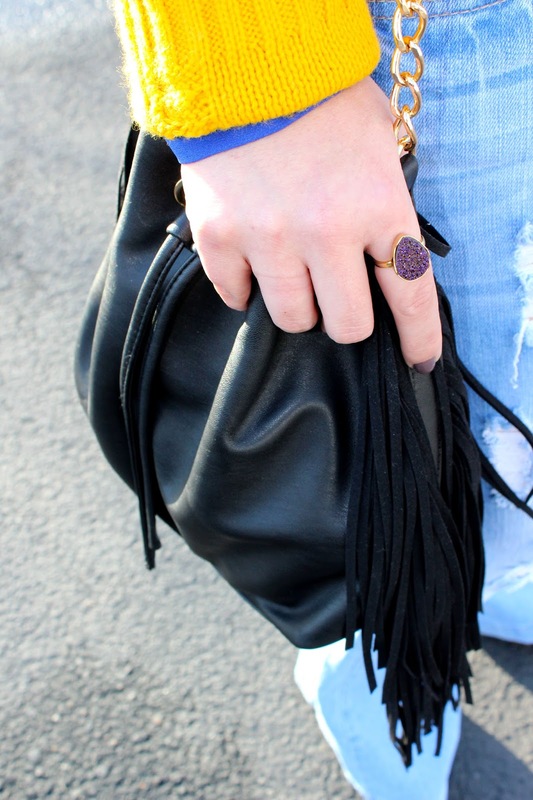 I ended up throwing on a pair of bell bottom jeans and my favorite fringe bucket bag. I threw on a bright colored necklace which only added to my bright mood. I love the pearl detail on the collar of my blouse. 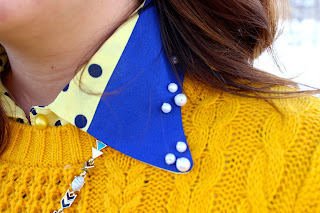 I couldn't resist adding more yellow detail and the blue polka dots are a fun take on a traditional print. This outfit is so nice Kim I love the 70s vibe. I'm completely with you on the wanting some sunshine it's miserable here in the UK at the moment. Great post my lovely friend you look gorgeous! Love that color!!! So pretty on you! I loooove a good mustard-you look great in it Kim! 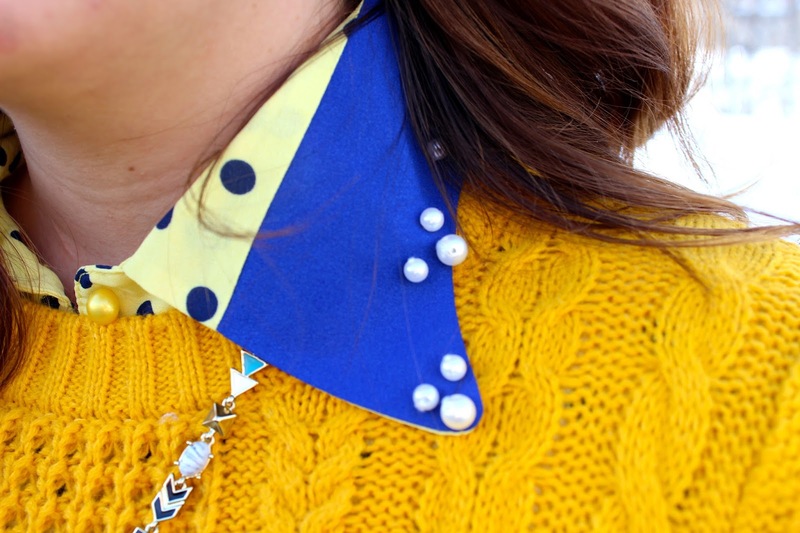 I love the pop of pearl on the collar too- great outfit! You look great, these colors are WOW! I love it all! Yellow is definitely your color! You look gorgeous, Kim! I also really like the collar underneath, so cute! 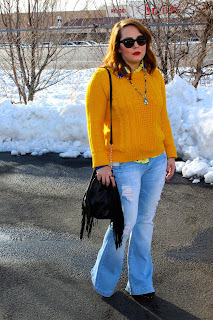 Kim, I really loved this outfit when I saw it on Instagram because of the bright yellow color. Now that I see all of the details, I love it even more! 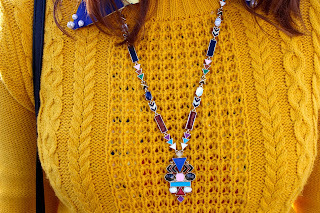 The pearl details on the collar are gorgeous and so is that necklace. It's the perfect way to add a little sunshine to gray winter days. I hope you're having a gorgeous weekend!